DOWN THE ISLE. 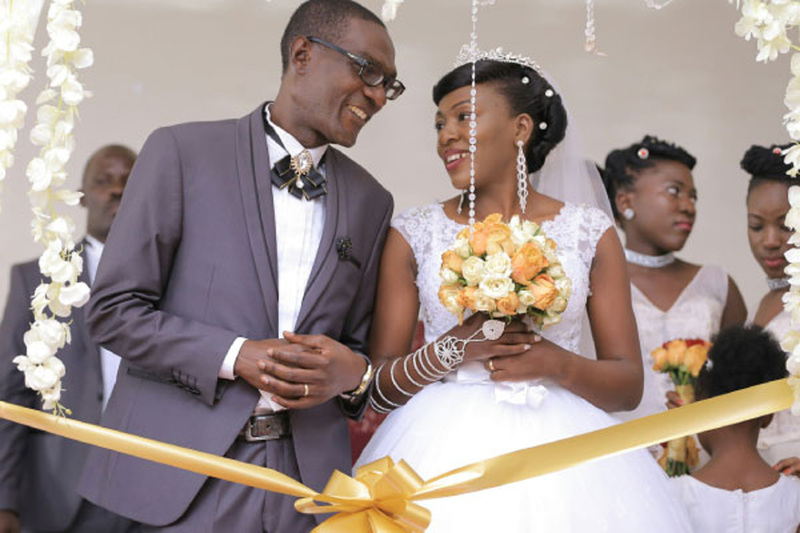 Thomas Kagera, a business editor, at New Times Rwanda, and Margaret Kiwuka, a customs officer at URA, exchanged vows recently. The couple has three children and they shared their love story with CHRISTINE KATENDE. Thomas: I knew Margaret in 1993 when I was at university and she was staying at her older sister’s home. That sister is my cousin’s wife. Because we lived in their neighbourhood, paying a visit to her family was not a hassle. The more I saw this young girl, the more I got to like her and I remember making my intentions known in 1996. I could not marry her then because she was in her Senior Six vacation. Margaret: Thomas used to frequently visit us but I had never felt I would fall in love with him. One day, he approached me. What was your reaction when he told you about how he felt about you? Margaret: I was confused, wondered why he chose me out of all the girls and I was still in school. I remember asking him why he chose me. However, I gave myself two years to think about it. When he returned, I was in second year and I felt ready. What did you consider when he approached you again? Margaret: I had studied him, I realised he was God-fearing, soft spoken, and loves children. That among others made me believe he was the right person. Thomas, what attracted you to her? Thomas: Margaret is beautiful, focused, loving, friendly and motherly. So, for how long have you stayed together? Thomas: We made 20 years in March and God has blessed us with three beautiful girls. We have worked and developed together. Thomas: After our introduction in March 22, 1998 while she was still at the university and we moved in after school. Margaret: Thomas had wanted the wedding to happen after our introduction but my parents asked him to wait for me to complete school. He waited for eight months. Margaret: I did not look for a job like other graduates do. I went straight to my home. We had our children in the first 10 years of living together. What has it been like the last 10 years? Thomas: Rethinking and reforming our lives. It involves thinking about your spouse and considering her before taking any decision. Indeed Margaret has helped me become a better person. When did you decide to wed? Thomas: In 2016, after agreeing on the date, we drafted our budget and the preparations started. Which date did you pick? Thomas: On December 28, 2017 at St Paul’s Namirembe Cathedral. The ceremony was presided over by the retired Bishop Dr Keefa Kamya Ssemakula, assisted by Vicar Festo Karungi. How did you plan for your wedding? Margaret: After setting the date, we drafted a budget then started preparation meetings. I had eight meetings in three months. Thomas: They ran from October to December at a venue in town. What kind of rings did you use? Thomas: Gold rings which I bought from City Jewellers at Shs500,000 each. What was you theme colour? Margret: Gold and sky blue, the combination looked vibrant and it matched my black and gold changing dress. Margret: Ms Rebecca Nakitto charged us Shs5m. Thomas: We hired Pix Studios from Sheraton at Shs2m for both video and photography. We went to Sheraton for garden pictures to minimise the delays by traffic jam. How much did you invest in food? Margaret: Instead of paying Shs25,000 per plate, we decided to buy our food and only paid for labour. We spent about Shs4m. At least every guest had a plate of food including those who arrived late. This would not be so with a catering service provider who had initially cautioned us about incurring extra costs for excess plates. How much did your suit cost? Thomas: I had two, Scofield Kivumbi, a church witness then Joseph Kasibante Ssentamu who was there after church. Kivumbi is my brother, friend and he is married. Kasibante is my nephew and childhood friend. I chose my nephews for groomsmen because they match in size and skin complexion. Who was your maid of honour? Margaret: My elder sister Aidah Kivumbi because she is my friend and mentor. Three of the bridesmaids are my daughters and my niece because they have matching body features. Did you have any fears? Thomas: Yes, time management given the fact that Margaret had spent a night at her parents’ home in Bombo but thank God they made it on time. We got to church by 10am. Margaret: The time the reverend asked if there was anyone opposed to our marriage. No one said a thing and I became calm. What excited you the most on your wedding day? Thomas: When we exchanged rings. Margaret: I felt happy when Thomas put a ring on my finger and he sang for me at the reception. Thomas: The DJ was inconsistent. Despite the playlist and instructions we gave him, he played all the selected songs before we entered. I then requested for a song, Lowooza Kunze by Elly Wamala and I sang for my wife. Margaret: I had selected specific songs that would play at particular intervals but the DJ disappointed. The maids and groomsmen had prepared to dance but it did not happen. Apart from the song my husband sang, we also mimed Njagaza akajanja by Ronald Mayinja. Also the food was delayed yet it had been prepared from close by. I did not feel good because most of my best friends missed the wedding. What excited you the most while in honeymoon? Thomas: We had a short time for honeymoon, but, I enjoyed time with my newly wedded bride. Margaret: Being together with my husband was very exciting. How different is it now that you are wedded? Thomas: Before the wedding, you live just like any other couple but after God’s intervention, things change. Because of the premarital counselling, I am now fully committed to my wife and we do things together such as holding discussions about certain issues and praying together. Margaret: I am more respected and recognised at church and at home. We are a role model couple. We strive to make sure all we do is godly unlike before. How important was premarital counselling? Thomas: We were told that marriage is God’s idea. I am set to multiply respect, love, among other things I give her. Margaret: I was told to be more prayerful and forgiving. The counsellor also emphasised things such as praying together, being better communicators and to sometimes surrender for the betterment of the marriage. What are you planning to do better after this holy matrimony? Thomas: I am looking to the future with hope, I have refused to be a prisoner of my own history, I have opened new chapters. If I cannot change the past, I have the power to do something better and more for the future. We are now building our future and that of our children together. Margaret: Building him, having good communication, being open, working together, respecting each other and loving more. Given chance to re-wed, what would you make better? Thomas: I would look for a more professional DJ. Margaret: Nothing except the music person. Did you have any debt after? Margret: Yes, it was Shs600,000 for the cake. Instead of hiring a service provider who ask you to pay for food per plate, come up with a satisfactory and befitting menu and hire a catering company for labour. This might save you extra costs that come with serving extra guests. Having a cake tier on each table is trending. Consider having fewer tiers for the main cake you will cut and serve and let the guests enjoy what you place on their tables. Choose a gown that suits your body shape and taste. Given Margaret’s small body, she opted to hire a snow white Cinderella gown at Shs1m. It flattered her shape and the make allowed her comfort. Margaret appended her signature on the marriage certificate as a sign to seal their bond. It is advisable to go to a church that is licensed to carry out weddings. The couple mimed at least two love songs, Lowooza Kunze by Elly Waamala and Njagaza Akajanja by Ronald Mayinja which made the function vibrant because the DJ had disappointed them. Three of the bridesmaids are Margaret’s daughters and the fourth is her niece. This is one way of strengthening a family bond.